Discussion in '2001-2005 Explorer Sport Trac' started by fatfenders, August 3, 2013. 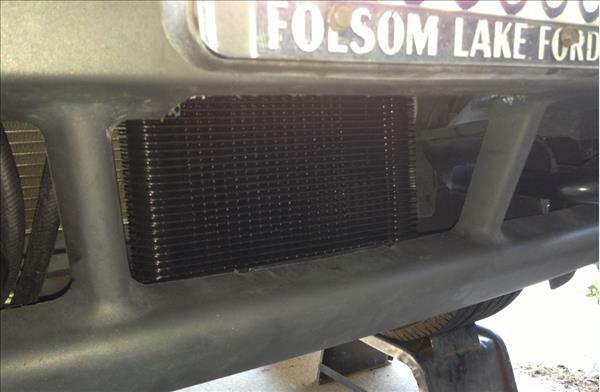 Has there ever been any discussion/comments/dialog regarding the stock location of the transmission cooler? I just recently noticed (despite having purchased it new... 85k miles now) that only about 40% of the cooler gets any ram air effect. 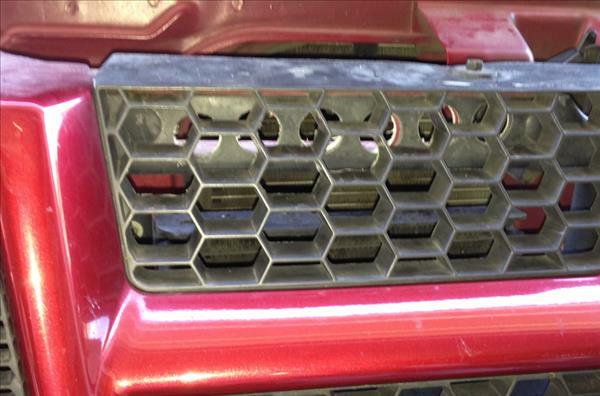 About 60% is blocked by they way the grill is designed. I did have to swap out the valve body a coupla years ago which fixed the infamous 2-3 shift flair and I have not had any issues since. I have not installed a trans temp gauge so I have no idea what temps are. It does not get driven hard. i run a secondary fin style cooler in line of the factory cooler and placed it up higher to get full contact with the air. my trans temp is measured at the pressure port right in front of gear shifter and highest i reach is 195 while climbing a steep hill off-road. this hill is greater than any hill you will see on the expressway. Thanks for the reply Mike. I too plan on adding a secondary cooler which I currently have on order along with a gauge. For the first time I am going to be towing a small (1200 lb. camping trailer) and I don't want any trans. temp issues. But while waiting for those items I decided to relocate the stock cooler from the stock location where I estimate less than 40% was getting any direct ram air effect. This mod took less than a day to complete and the only cost was a few feet of line. Call me obsessive but I even went to the trouble to punch holes in the structure behind the upper grill in an attempt to eke out every last bit of ram air effect I could. Now probably 80-90% of the cooler gets ram air. I mfgr'd both an upper and lower bracket designed to bring the cooler up so that the lowest plate was slightly above the lower grill opening. Now here is the surprising part. Before I put a wrench to anything I took it on a 12 mile freeway run (two long hills) with O/D disengaged. That's darn near a 30º reduction. Sure wish I would have done this the day after I bought it! I'm having trouble seeing the pictures. I know this is an old thread, but a how-to is worth being to the top, right? I'm curious, did all 1st gen Sport Tracs come with aux trans coolers? Was it a dealer add-on? My aux cooler looks like it was mounted by the factory, but the lines are installed with worm-gear type clamps which suggests an aftermarket add-on. If it's a tow package thing, my truck has factory trailer light wiring, but a Reese brand hitch. 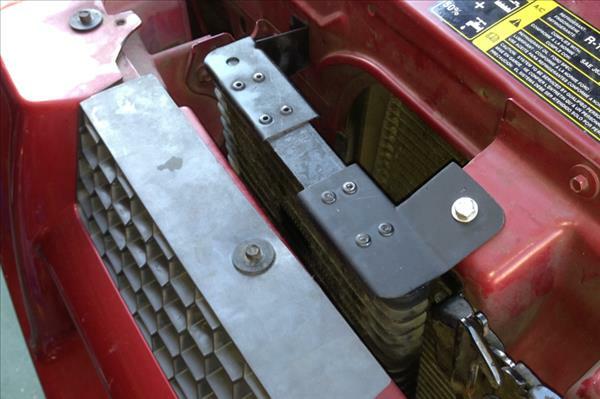 Trans cooler is std equipment, along with the worm-gear hose clamps. I have the towing pkg on my '01 EB and my '01 ST, but the hitch on the EB is a Draw-Tite and the ST only has a bumper hitch. I don't think the hitch itself was included with the towing pkg. What was included then, if not the single most important piece of hardware? My '00 Ranger had an oem 4-pin, but not a hitch, come to think of it. It simply had a bumper hole. I believe that the towing pkg included heavy duty rear springs, maybe HD shocks some additional relays and maybe a HD flasher. 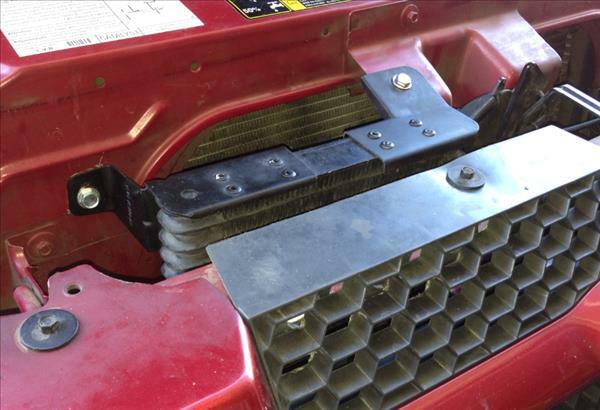 It also included the 4-flat pigtail and bumper mounting bracket for the trailer plug. Not much really. My '92 Jimmy at least came with the actual receiver. I do like the isolated tow light circuits. I see alot of value in those. I occasionally find myself towing an unfamiliar trailer while helping friends or family with something. I always hold my breath when I connect the lights. Some makes/models pull all of the current through the headlight switch. 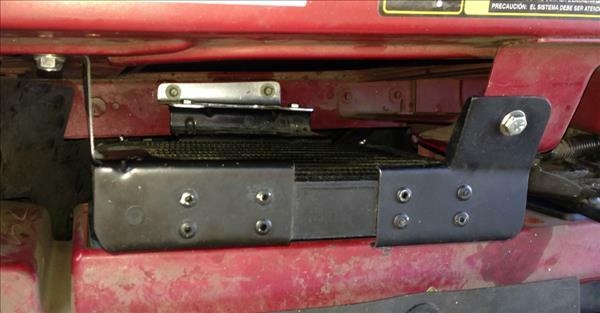 All of the trailer load can overheat the switch in the cab. True. I once melted the turn signals/brake light circuit because the trailer I was towing was missing a ground wire and grounded through the trailer ball, which was not a good enough ground. That's pretty crazy! The ball & socket were acting as a switch, closing and opening the brake light/turn signal circuit, thus turning them on and off while they were called for? Yea, it worked, just made for a lousy ground with too much resistance. It was a 71 Road Runner and the nylon piece under the the steering wheel had brass contacts for the signal/brake circuits which melted into the nylon and no longer made contact, so no turn signal or brake lights. Sorry about those images. I uploaded them to a (paid for) web server that has since been deleted. I just uploaded them to a free web server so they should be around a while. Where/how I relocated the original cooler. The lower bracket is shown here. A little overkill perhaps but I wanted to get every little bit of ram air on that cooler that I could. Notice the holes I bored into that plate. I Also added a bigger aftermarket cooler near the original front license plate location. 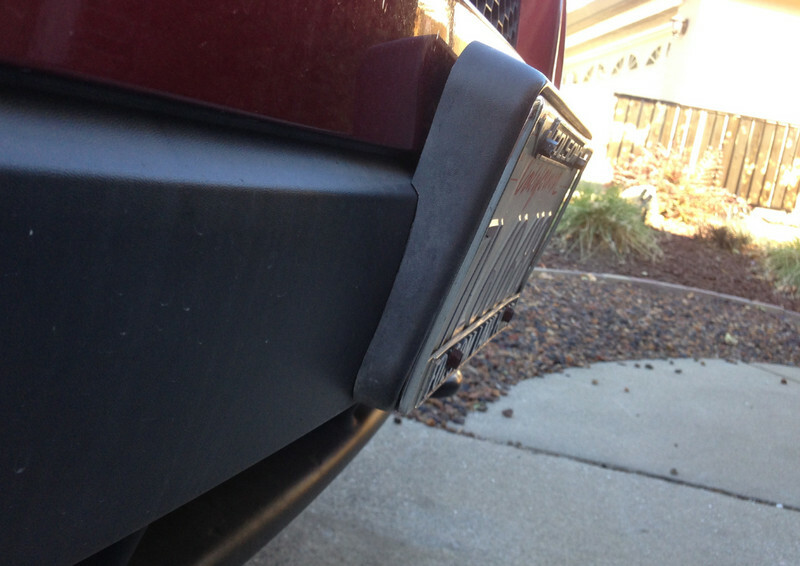 And rotated the original license plate surround 180 and sculpted the thing to fit the bumper. This effort results in the cooler getting maximum ram air effect. 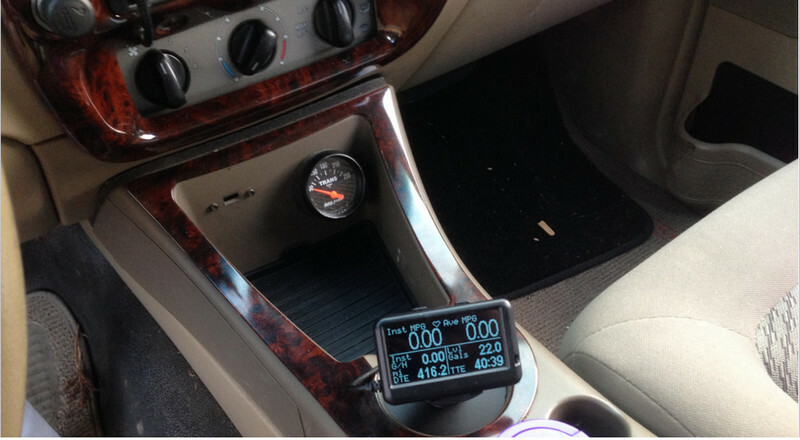 And here is where I mounted the trans temp gauge. I removed the trans pan and welded a bung on it for the sender so I am showing the fluid temperature in the pan. Thanks! Great pictures. I noticed there are about 3-4" wasted space at the top of my stock cooler. Im tempted to find a stacked plate type with the same width, but taller than stock. My truck only has 39,000 miles, so I'm kinda at the starting line for preventative maintenance. I had a similar thought, the heat would be generated at the point of resistance if there was an issue of poor continuity. I would hypothesize that the worst continuity is the ball mount to the hitch receiver. Two loose fit painted surfaces. I dont think 12v is enough to damage a trailer hitch.. Maybe the paint? I suspect the real issue was a heavy load on a poor switch design. I didnt say anything because I think the point he was making stands: A trailer cooked his tail light circuit which couldn't happen on a ST with isolated trailer light circuits. I got thinking about this. I really was thinking about running something similar, but I discovered the Torque app on Android can pick up the trans fluid temp. It actually has two different readings that run about 5-10 degrees apart from each other. Maybe two OE trans temp sensors? I am not concerned about trans fluid temp during everyday driving. When I tow or make long mountain treks, I like to keep an eye on it. I have also installed an aftermarket trans pan with a drain plug. I plan to drain and fill annually (replace 40% or so). I did it on my Chevy Trailblazer for several years and the fluid stayed nice and pink. Valvoline Mercon V is cheap right now (<$5 at napa). Edit: I learned that the two trans temps coming through are distinct values, likey from the same sensor. One is defined by Ford as trans temp in degrees and the other is defined as trans temp in volts which is then converted to degrees by the Torque app with this equation: (((A*256)+B)*-0.0036)+212.98. Just information. I occasionally use the app to get a 'feel' for everyday temps. I usually leave the obdII connector plugged in full time and launch the app on occasion. Today I saw temps level at 150-155 degrees in 50 degree weather. No load, mixed driving. Everything I have come across has indicated that 160-200 is normal, 200-220 is considered running hot, and 250 dangerous.